A .QWK Compatible Off-Line Mail Door For The WWIV BBS System. WARNING: WWIVMail/QWK v4.3 is ONLY for WWIV v4.20-4.21a ONLY. latest(4.4 or whatever newer version is out at the time). WWIVQWK.EXE 32/64-SUB SELF-DETECTING WWIVMail/QWK EXECUTABLE. WWIVMAIL.REV REVISION HISTORY/CHANGES IN WWIVMail/QWK. WWIVMAIL.CFG SAMPLE SYSOP CONFIGURATION FILE (OPTIONAL). REGISTER.LST LISTING OF ALL CURRENTLY REGISTERED SYSOP/BBS BOARDS. please take the time to read this documentaion. incorporate those messages back into your WWIV BBS System. through WWIVMail/QWK in the .QWK stanadrd .REP response packet. Turbo C++ 1.0 or newer. (1) Built-in Communication routines( no need to monitor dos interrupts ). support for comm port speeds up to 38,400. (2) Ansi color graphics support. (3) Easy to use interface. See below for External Protocol documentation. (5) Monitors Carrier Detect ( recycles back to the BBS ). (6) 2 minutes time-out between keystrokes. validation for Posts ( Net / User restrictions ) are maintained. (10) Optional Newfiles Scan right in the DOOR! (11) Full WWIV Multi-Net(WWIV 4.21a) support capabilities built-in. (12) Support for both 32 and 64 Messages Areas (Auto-Detecting). (13) Support for Modified Userrec's! Very helpful for non-IBM users. (15) Translates WWIV Colors into ANSI codes if the user desires. WWIVMail/QWK and it's related files are NOT public domain or freeware. is NOT responsible for any damage to your system, software or your life. this project regarding compatibilty with their HEAVILY modified WWIV systems. have modified the way data is stored in the user's files( .dat, .sub, etc). (Compiles Under BC++ v2.0(or newer) and TC++ 1.0(or newer). 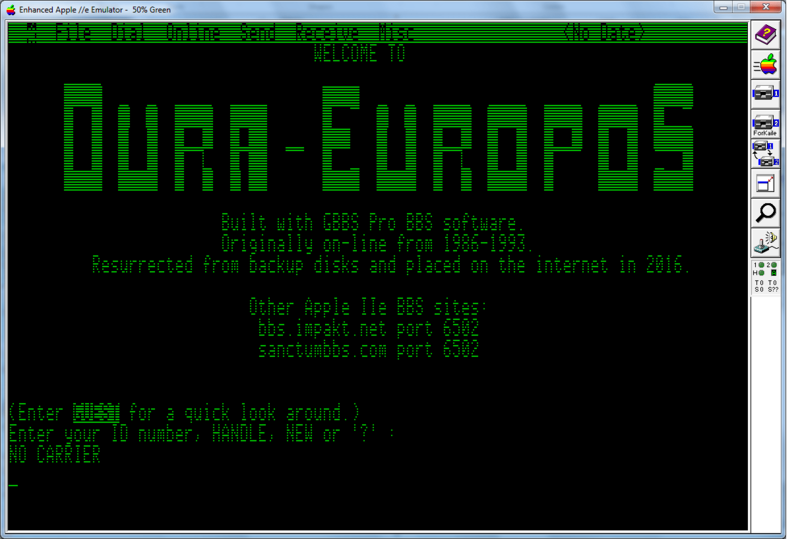 it also has the ability to import messages from non-WWIV BBS systems. Now, why should I register? 1) WWIVMail/QWK is not crippled in any way. I have released it on trust. (see below for address and contact information). effort to enhance the capabilities of WWIVMail/QWK. this file you will see a listing of the BBS files that WWIVMail/QWK uses. and then WWIVMail/QWK will run correctly. WWIVFile : v1.1 External Transfer Section File Manager. Topten : v1.0 Lists the top Download Files from your BBS by section. Master : v1.0 BBS Door for users to Download A Master File List. WWIV Home Board in Los Angeles, California. 2) Join the WWIVMail/QWK Support Sub on the WWIVnet. Contact Rambo of Rambo-Scan BBS(#[email protected]) to join. (818) 566-7912.
the WWIVMail/QWK sub, I will respond quickly. in your init.exe program field. capitialization), in your init.exe program field. also let you know how you can obtain the source code for WWIVMail/QWK. I currently support both working storage types of WWIV ver 4.21a. (last time I looked into it), so, I also fail to fully support it. then military time standard); therefore, I have to convert those as well. scared you away with all my talk of registration and compatibility. Copy the file WWIVQWK.EXE to your main bbs dir. and obtain the source from me for modification. the .QWK packet creation( The user will be warned if disk space gets low ). don't do this( and it will warn you ). 4) Make sure you have a copy of ALL external programs in your path. the command-lines as they are in the INIT.EXE( stored in nextern.dat). BBS in your path so the user can pack/extract the .QWK/.REP packets. you put into the BBS, the more functionality that goes into WWIVMail/QWK. The extent of these functions is only limited by you. the transfer or compress/uncompress the packet. them listed in the INIT.EXE fields. 5) What files does WWIVMail/QWK Create? wwivmail.usr will be created and placed in your wwiv main directory. The size of this file will grow as more users begin to use the door. first eight characters, with any blanks being replaced by underscores. Obviously, you will want to modify these fields! But, here is what they are..
LINE1: The CITY/STATE where your BBS is located. LINE2: Maximum TOTAL messages that can be downloaded at 300 Baud. LINE3: Maximum TOTAL messages that can be downloaded at 1200 Baud. LINE4: Maximum TOTAL messages that can be downloaded at 2400 Baud. LINE5: Maximum TOTAL messages that can be downloaded at 9600 Baud. LINE6: Maximum TOTAL messages that can be downloaded at 14400 Baud. LINE7: Maximum TOTAL messages that can be downloaded at 19200 Baud. LINE8: Maximum TOTAL messages that can be downloaded at 38400 Baud. or a path to a file that doesn't exist, the entry will just be ignored. back to dos. Type 'wwivqwk local' and the door will go into local mode. For Downloads: Go through the menus as you would if you were on-line! it won't do anything ( no way to save your posts ). "wwivqwk local nowrite" or "wwivqwk nowrite local"
can't post on a sub, neither will WWIVMail/QWK in import mode. So, what the heck does this option do? communications program to call and get your messages. (where xxxxxx is the name of the packet you want to import). inform you that a messages.dat couldn't be found. for explanation on how to get around this). probably make you just a little mad!). After completion, messages.dat is deleted. How do I handle over-riding the sub number? conference numbers greater then the available subs on your WWIV bbs. Let's continue to use the RAMBO-SC.QWK example from above. And that's how your "map" file would look. So, to finalize this..
order and the second is where you want those conferences to "map"
conference you wish to "map". plan on importing from(and want to control what messages go where). one message sub....but, that's me! the system didn't take a dive! the message in the local Sub and mark it as pending for net status. directory(or whichever directory is set-up under a multi-net environment). and the messages will be sent out on the net. the message in the local sub AND will CREATE/ADD TO the p1.net file. logs off the board, and the message(s) will be sent out on the net. all net actions will be maintained. Here is an example on how NET E-Mail looks on the receiver's end. to my account on Amber (#[email protected] was how it was addressed). SLMR 2.1a All hope abandon, ye who enter messages here. .....And this is what I expected. just as it was any other piece of E-Mail. \DATA directory(as it is defined in INIT.EXE). Foundation....(Of Dark D.) who helped me design the network support. for the IMPORT mode...thanks for the great ideas! Wayne Bell....what do ya want for 50 bux! compile with your modified header files. What Do I Do if I have a modifed USERREC? have modifed your user.lst. If not, use the .exe included in this .zip file. a stock vardec.h)...I used this .lib as well! 1) Get your programming environment set-up. A) Copy the qwk.lib into your .lib directory. tcc v1.0(or higher) and tlink). This is what was used in the making of WWIVMail/QWK v4.3. ie; -Ie:\BC31\INCLUDE must be changed to match your system. places in WWIVMail/QWK where your userrec is accessed) are accessable. your usserec.cpp into userrec.obj using the large memory model. Message Bases for BBS operation. Don't change this!